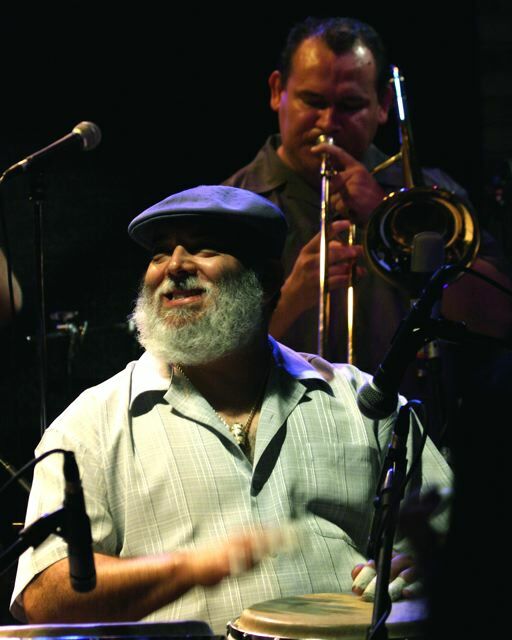 Last night I saw Poncho Sanchez and His Latin Jazz Band play their fourth and final set in a two-night stay at the Dakota. What a class act. What a bunch of pros. What a pleasure. 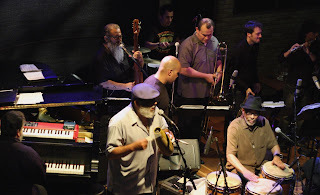 Unless you don’t enjoy the head-nodding, foot-tapping, hip-shaking—oh, just get up and dance, will you?—sounds of Latin jazz, you simply can’t go wrong with this band, whether they play a concert hall (like the Ordway in 2008, where I heard them last), a club (like the Dakota), an outdoor festival, or a street dance. I’d love to see them at a street dance someday, with moms and dads doing the salsa and teenagers strutting around and little kids jumping up and down. The music began at 10 p.m. and ended after an encore at 11:15 or so. People danced among the Dakota’s tables. The band was relaxed, easy, comfortable, yet tight and precise. It seemed like a show you could have recorded and issued on CD with no second takes. A mix of faster and slower tunes, instrumentals and vocals, a lot of hot music packed into an hour-fifteen, all wonderfully entertaining. I didn’t get a set list and they didn’t announce all of the tunes, but here’s some of what we heard: “Night Walk,” “Co Co May May,” “Psychedelic Blues” (the title track of Sanchez’s latest CD on Concord), “Raise Your Hand” (the old Stax tune and the title track of his previous CD, a soul music celebration). No "Cantaloupe Island" or "Watermelon Man" or "Night in Tunisia" or "Afro Blue," which disappointed me just a little because I love the Latin versions of those tunes. The whole band played a syncopated “Happy Birthday” for the saxophonist, Javíer Vergara, whose birthday it was. 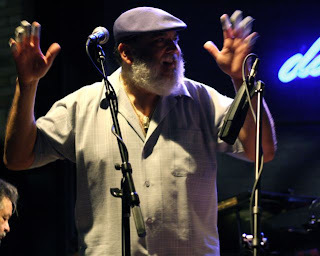 Near the end of the set, Sanchez brought up his good friend from Minneapolis, percussionist and drum maker Wallace Hill, to play the batá (a two-headed African drum shaped like a top-heavy hourglass, held in the lap and played on both ends; Hill’s has bells around the heads). Hill began with an intricate rhythm, Sanchez joined in, they traded ideas, they laughed, the band came on board, and then it was just Sanchez and Hill again. Sanchez sings well, as do his band members. When some band members were playing, the ones who weren’t stepped and swayed from side to side, moving with the rhythm. Everyone had the chance to solo, and while the solos were strong they were part of the fabric of the evening, never too long or showy. This is a band, an ensemble, a unit that has been together for many years, and it shows in every tune. (Some of the band members have been with Sanchez since his early days in Los Angeles clubs—more than 30 years.) If anything, I would have liked a few longer solos from Sanchez, the master conguero, and also from the ferocious timbalero George Ortiz. Afterward we hung out just long enough for Sanchez and his band to emerge from the green room and head for the bar. We went to greet Sanchez (I had met him at the Ordway and interviewed him before that show; I didn’t expect him to remember but I wanted to say hello anyway) and he was warm and charming. We learned that the band travels with about 200 songs and has a book of over 1,000 songs, that they are often freshened up with new arrangements, that it has become very costly to travel with congas because each weighs more than 50 lb. 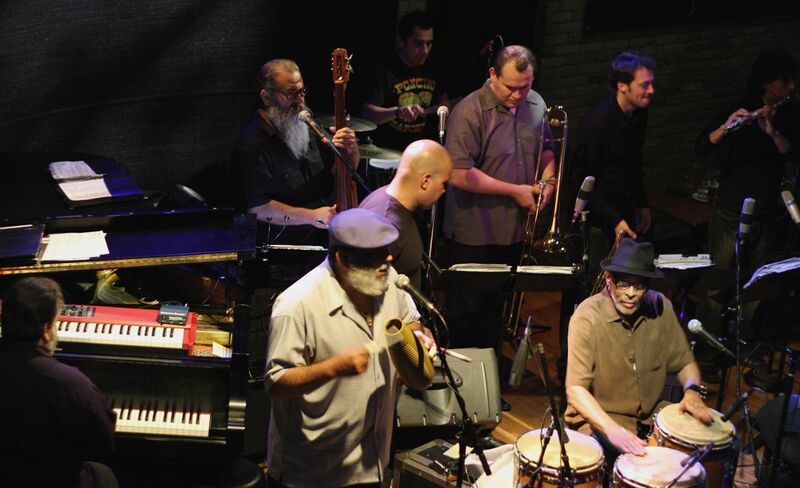 (At the Dakota, Sanchez played congas made by his friend Wallace Hill.) Sanchez’s fingers, all of which are taped when he plays (a technique he learned as a young man from Mongo Santamaria), are as soft and smooth as a baby’s. Photos by John Whiting. The lights were low and Poncho, as you can see, was wearing a hat.